The deal with Iran is done. Upon initial reading, it amounts to Iran getting the bomb in no more than 10 years. – Iran never admits what John Kerry says has been proven, that they have been performing weapon research. – As part of the deal Iran will expand it’s nuclear program to 190,000 centrifuge machines. – Iran will not allow inspectors to visit military sites. – Negotiations never included requiring freedom for 3 captive Americans. – This negotiation misses an opportunity regarding young Iranians unsatisfied with the old way. – Netanyahu says this deal is an historic mistake! – A nuclear arms race has now begun in the Middle East. – And, the President says no Congressional review or changes will be allowed. Wow, that sure feels like it must be a good deal. USAToday offers a good review of the Iran nuclear deal: What each side won and lost. Sanctions. Secretary of State John Kerry said Tuesday “relief of sanctions will only start when Tehran has met the commitments of this nuclear agreement,” including the removal and destruction of the Arak nuclear reactor core, and shipping uranium stockpiles abroad. Then sanctions relief will begin in stages, Kerry said. Uranium Enrichment. Iran said it would grow its enrichment infrastructure to 190,000 centrifuge machines to supply additional planned nuclear plants. Iran’s 20,000 installed enrichment machines, including 10,000 that were running in 2013, will be reduced to about 5,000 for 10 years, while research and development on more efficient machines will be limited. Iran agreed to dilute or convert its entire stockpile of medium-enriched uranium into another form that would be monitored by international inspectors, and to ship its stockpile of low enriched uranium to another country. Iran agreed to re-purpose the Fordow facility to isotope production and nuclear research rather than uranium enrichment, Kerry said Tuesday. The same process can also be used to enrich uranium. Hundreds of uranium enrichment machines in Fordow will be idled but not dismantled. Inspections. Iran refused to allow IAEA inspectors to visit sensitive military sites, arguing that many of them are spies working for Iran’s enemies. The deal allows inspectors to access “any site they deem suspicious,” according to a fact sheet released by the White House. Iranian objections to some visits will be handled through a dispute settlement process, according to the agreement. International monitoring will cover Iran’s entire uranium supply chain, including mines, processing and enrichment facilities, reactors and spent fuel, Obama said. Suspected Weapons Research. Iran has always denied that it conducted weapons-related research, and said its program is peaceful. Evidence to the contrary was forged, Iran has said. Before heading to Vienna for the last round of talks, Kerry said the United States already knows with certainty what Iran did in the past and that a full accounting is less important than monitoring what it does in the future. 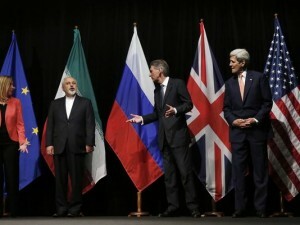 On Tuesday, Kerry said the IAEA signed an agreement with Iran to resolve its outstanding questions within three months. Sanctions relief will not occur until that investigation is complete, Kerry said. It’s not clear how exhaustive the IAEA report will be. Duration. ran had sought freedom to expand its nuclear program indefinitely within a few years. Iran agreed to limit uranium enrichment and ship its uranium fuel overseas for 10 years. It agreed to a 15-year ban on processing fuel that is close to being bomb grade, conducting uranium research outside of one processing facility, building new heavy water reactors and accumulating fuel stockpiles greater than 200 lbs. IAEA inspectors will have full access to Iran’s nuclear program for 15 years, and some access “forever,” according to the State Department.